This article is about the U.S. state. 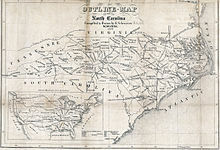 For the British colony from 1712–1776, see Province of North-Carolina. For other uses, see North Carolina (disambiguation). "The Old North State" redirects here. 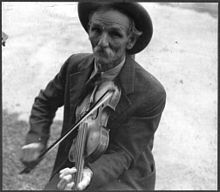 For the song of the same name, see The Old North State (song). State song(s): "The Old North State"
During colonial times, Edenton served as the state capital beginning in 1722, and New Bern was selected as the capital in 1766. Construction of Tryon Palace, which served as the residence and offices of the provincial governor William Tryon, began in 1767 and was completed in 1771. In 1788 Raleigh was chosen as the site of the new capital, as its central location protected it from coastal attacks. Officially established in 1792 as both county seat and state capital, the city was named after Sir Walter Raleigh, sponsor of Roanoke, the "lost colony" on Roanoke Island. The population of the colony more than quadrupled from 52,000 in 1740 to 270,000 in 1780 from high immigration from Virginia, Maryland and Pennsylvania plus immigrants from abroad. Democrats were elected to the legislature and governor's office, but the Populists attracted voters displeased with them. In 1896 a biracial, Populist-Republican Fusionist coalition gained the governor's office and passed laws that would extend the voting franchise to blacks and poor whites. The Democrats regained control of the legislature in 1896 and passed laws to impose Jim Crow and racial segregation of public facilities. Voters of North Carolina's 2nd congressional district elected a total of four African-American congressmen through these years of the late 19th century. Most of the English colonists had arrived as indentured servants, hiring themselves out as laborers for a fixed period to pay for their passage. In the early years the line between indentured servants and African slaves or laborers was fluid. Some Africans were allowed to earn their freedom before slavery became a lifelong status. 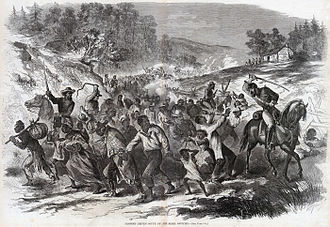 Most of the free colored families formed in North Carolina before the Revolution were descended from unions or marriages between free white women and enslaved or free African or African-American men. Because the mothers were free, their children were born free. Many had migrated or were descendants of migrants from colonial Virginia. As the flow of indentured laborers to the colony decreased with improving economic conditions in Great Britain, planters imported more slaves, and the state's legal delineations between free and slave status tightened, effectively hardening the latter into a racial caste. The economy's growth and prosperity was based on slave labor, devoted primarily to the production of tobacco. 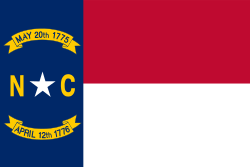 On November 21, 1789, North Carolina became the twelfth state to ratify the Constitution. In 1840, it completed the state capitol building in Raleigh, still standing today. Most of North Carolina's slave owners and large plantations were located in the eastern portion of the state. Although North Carolina's plantation system was smaller and less cohesive than that of Virginia, Georgia, or South Carolina, significant numbers of planters were concentrated in the counties around the port cities of Wilmington and Edenton, as well as suburban planters around the cities of Raleigh, Charlotte, and Durham in the Piedmont. Planters owning large estates wielded significant political and socio-economic power in antebellum North Carolina, which was a slave society. They placed their interests above those of the generally non-slave-holding "yeoman" farmers of western North Carolina. In mid-century, the state's rural and commercial areas were connected by the construction of a 129 mi (208 km) wooden plank road, known as a "farmer's railroad", from Fayetteville in the east to Bethania (northwest of Winston-Salem). North Carolina was known as a 'Slave State' by 1860, in which one-third of the population was enslaved. This was a smaller proportion than in many other Southern states. 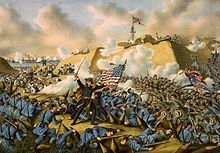 The state did not vote to join the Confederacy until President Abraham Lincoln called on it to invade its sister state, South Carolina, becoming the last or penultimate state to officially join the Confederacy. 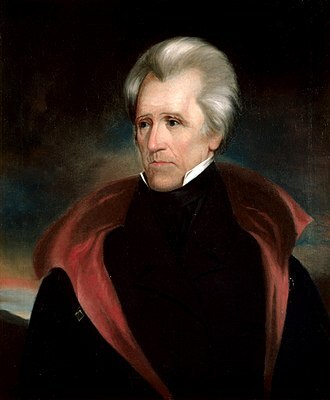 The title of "last to join the Confederacy" has been disputed; although Tennessee's informal secession on May 7, 1861, preceded North Carolina's official secession on May 20, the Tennessee legislature did not formally vote to secede until June 8, 1861. North Carolina topographic map. North Carolina's three topographic regions are evident: the Appalachian Mountains in brown, the Piedmont in yellow, and the Atlantic Coastal Plain in green. As of 2010, 89.66% (7,750,904) of North Carolina residents age 5 and older spoke English at home as a primary language, while 6.93% (598,756) spoke Spanish, 0.32% (27,310) French, 0.27% (23,204) German, and Chinese (which includes Mandarin) was spoken as a main language by 0.27% (23,072) of the population over the age of five. In total, 10.34% (893,735) of North Carolina's population age 5 and older spoke a mother language other than English. North Carolina is also home to a spectrum of different dialects of Southern American English and Appalachian English. In 2017, the US Census Bureau released 2016 population estimate counts for North Carolina's cities with populations above 70,000. 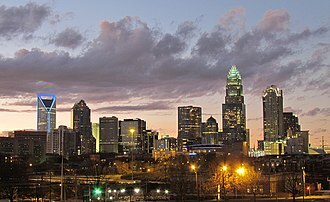 Charlotte has the largest population, while Raleigh has the highest population density of North Carolina's largest cities. The state has a very diverse economy because of its great availability of hydroelectric power, its pleasant climate, and its wide variety of soils. 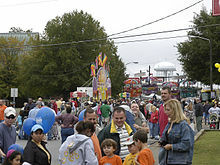 The state ranks third among the South Atlantic states in population, but leads the region in industry and agriculture. North Carolina leads the nation in the production of tobacco , textiles, and furniture. Charlotte, the state's largest city, is a major textile and trade center. According to a Forbes article written in 2013 Employment in the "Old North State" has gained many different industry sectors. Science, technology, engineering, and math (STEM) industries in the area surrounding North Carolina's capital have grown 17.9 percent since 2001, placing Raleigh-Cary at No. 5 among the 51 largest metro areas in the country where technology is booming. In 2010, North Carolina's total gross state product was $424.9 billion, while the state debt in November 2012, according to one source, totalled US$2.4bn, while according to another, was in 2012 US$57.8bn. In 2011, the civilian labor force was at around 4.5 million with employment near 4.1 million. 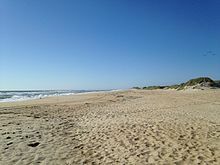 North Carolina has 15 metropolitan areas, and in 2010 was chosen as the third-best state for business by Forbes Magazine, and the second-best state by Chief Executive Officer Magazine. Since 2000, there has been a clear division in the economic growth of North Carolina's urban and rural areas. While North Carolina's urban areas have enjoyed a prosperous economy with steady job growth, low unemployment, and rising wages, many of the state's rural counties have suffered from job loss, rising levels of poverty, and population loss as their manufacturing base has declined. According to one estimate, one-half of North Carolina's 100 counties have lost population since 2010, primarily due to the poor economy in many of North Carolina's rural areas. However, the population of the state's urban areas is steadily increasing. Golf is a popular summertime leisure activity, and North Carolina has hosted several important professional golf tournaments. Pinehurst Resort in Pinehurst has hosted a PGA Championship, Ryder Cup, two U.S. Opens, and one U.S. Women's Open. The Wells Fargo Championship is a regular stop on the PGA Tour and is held at Quail Hollow Club in Charlotte, while the Wyndham Championship is played annually in Greensboro at Sedgefield Country Club. College sports are also popular in North Carolina, with 18 schools competing at the Division I level. The Atlantic Coast Conference (ACC) is headquartered in Greensboro, and both the ACC Football Championship Game (Charlotte) and the ACC Men's Basketball Tournament (Greensboro) were most recently held in North Carolina. College basketball in particular is very popular, buoyed by the Tobacco Road rivalries between ACC members North Carolina, Duke, North Carolina State, and Wake Forest. The ACC Championship Game and the Belk Bowl are held annually in Charlotte's Bank of America Stadium, featuring teams from the ACC and the Southeastern Conference. Additionally, the state has hosted the NCAA Men's Basketball Final Four on two occasions, in Greensboro in 1974 and in Charlotte in 1994. North Carolina has five professional opera companies: Opera Carolina in Charlotte, NC Opera in Raleigh, Greensboro Opera in Greensboro, Piedmont Opera in Winston-Salem, and Asheville Lyric Opera in Asheville. Academic conservatories and universities also produce fully staged operas, such as the A. J. Fletcher Opera Institute of the University of North Carolina School of the Arts in Winston-Salem, the Department of Music of the University of North Carolina at Chapel Hill, and UNC Greensboro. Among others, there are three high-level symphonic orchestras: NC Symphony in Raleigh, Charlotte Symphony, and Winston-Salem Symphony. The NC Symphony holds the North Carolina Master Chorale. The Carolina Ballet is headquartered in Raleigh, and there is also the Charlotte Ballet. North Carolina has a variety of shopping choices. SouthPark Mall in Charlotte is currently the largest in the Carolinas, with almost 2.0 million square feet. Other major malls in Charlotte include Northlake Mall and Carolina Place Mall in nearby suburb Pineville. Other major malls throughout the state include Hanes Mall in Winston-Salem, North Carolina, The Thruway Center in Winston-Salem, North Carolina, Crabtree Valley Mall, North Hills Mall, and Triangle Town Center in Raleigh; Friendly Center and Four Seasons Town Centre in Greensboro; Oak Hollow Mall in High Point; Concord Mills in Concord; Valley Hills Mall in Hickory; Cross Creek Mall in Fayetteville; and The Streets at Southpoint and Northgate Mall in Durham and Independence Mall in Wilmington, North Carolina, and Tanger Outlets in Charlotte, Nags Head, Blowing Rock, and Mebane, North Carolina. "The Old North State (song)"
^ "North Carolina". Modern Language Association. Retrieved August 11, 2012. ^ "North Carolina Climate and Geography". NC Kids Page. North Carolina Department of the Secretary of State. May 8, 2006. Retrieved November 7, 2006. ^ "Median Annual Household Income". The Henry J. Kaiser Family Foundation. Retrieved December 8, 2016. ^ Roberts, Deon (November 15, 2018). "Charlotte regains its place as No. 2 U.S. banking center. Will it keep it?". The Charlotte Observer. Retrieved December 1, 2018. ^ "Mount Mitchell State Park " History". Retrieved November 7, 2010. ^ a b "North Carolina American Indian History Time Line". North Carolina Museum of History. Retrieved September 14, 2016. ^ a b Richards, Constance E. (Spring 2008). "Contact and Conflict" (PDF). American Archaeology. p. 14. Retrieved June 26, 2008. ^ D. Moore. (1997) "A General History of Blackbeard the Pirate, the Queen Anne's Revenge and the Adventure". In Tributaries, Volume VII, 1997. pp. 31–35. (North Carolina Maritime History Council). ^ North Carolina Department of Cultural Resources. "Capitol History". Retrieved May 16, 2013. ^ "Chapter 5", 1898 Wilmington Race Riot Commission Report, North Carolina Dept. of Cultural Resources. ^ Richard H. Pildes, "Democracy, Anti-Democracy, and the Canon", Constitutional Commentary, Vol.17, 2000, p. 27. Retrieved March 10, 2008. ^ Pildes (2000), "Democracy, Anti-Democracy, and the Canon", pp. 12–13. ^ Patrick Gibbs; Moore, David G.; Beck Jr., Robin A.; Rodning, Christopher B. (March 2004). "Joara and Fort San Juan: culture contact at the edge of the world". Antiquity.ac.uk. Archived from the original on July 24, 2011. Retrieved July 24, 2011. ^ "North Carolina State Library – North Carolina History". Statelibrary.dcr.state.nc.us. Archived from the original on February 5, 2009. Retrieved July 24, 2011. ^ "Cherokee Indians". 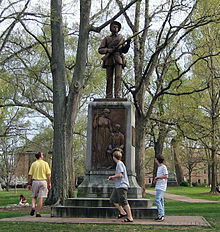 Uncpress.unc.edu. November 16, 1919. Retrieved July 24, 2011. ^ a b "Ancestry of the Population by State: 1980 – Table 3a – Persons Who Reported a Single Ancestry Group for Regions, Divisions and States" (PDF). Retrieved May 11, 2012. ^ a b "Table 1. Type of Ancestry Response for Regions, Divisions and States: 1980" (PDF). Retrieved May 11, 2012. ^ "Indentured Servitude in Colonial America". Webcitation.org. Archived from the original on October 24, 2009. Retrieved May 11, 2012. ^ "Paul Heinegg, Free African Americans in Virginia, North Carolina, South Carolina, Maryland and Delaware". Freeafricanamericans.com. Retrieved July 24, 2011. ^ "NC Business History – Railroads". Historync.org. Retrieved July 24, 2011. ^ a b "Historical Census Browser:Census Data for Year 1860". University of Virginia Library. 2004. Archived from the original on October 11, 2014. Retrieved June 26, 2014. 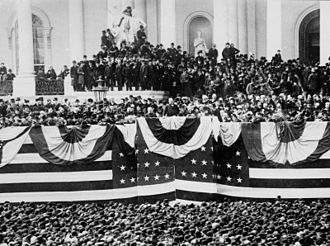 ^ "Center for Civic Education – Lincoln Bicentennial with Supplemental Lesson: Timeline". Civiced.org. Retrieved July 24, 2011. ^ "Highlights: Secession". Docsouth.unc.edu. Retrieved July 24, 2011. ^ "Today in History: June 8". Memory.loc.gov. April 9, 1959. Retrieved July 24, 2011. 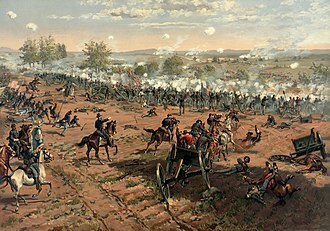 ^ "Civil War Facts About North Carolina". Classbrain.com. Archived from the original on July 23, 2011. Retrieved July 24, 2011. ^ a b c d e "K-12 Standards, Curriculum, and Instruction". North Carolina State Board of Education. Retrieved August 7, 2016. ^ "Regions and Divisions". United States Census Bureau. November 21, 2018. Archived from the original on December 15, 2018. Retrieved December 15, 2018. ^ "Blackbeard's Queen Anne's Revenge Coming Back to Beaufort". Beach Carolina Magazine. March 30, 2011. Archived from the original on February 21, 2013. ^ "People of North Carolina". North Carolina State Board of Education. Retrieved August 7, 2016. ^ "Facts About North Carolina Mountains". USA Today. Retrieved August 7, 2016. ^ a b "Facts for North Carolina's Mountain Region". Economic Development Partnership of North Carolina. January 21, 2011. Archived from the original on August 12, 2016. Retrieved August 8, 2016. ^ "Elevations and Distances in the United States". U.S Geological Survey. April 29, 2005. Archived from the original on January 16, 2008. Retrieved November 6, 2006. ^ a b "North Carolina River Basins". North Carolina Wildlife Resources Commission. Retrieved August 7, 2016. ^ "River Basin Interactive Map". NC Office of Environmental Education. Archived from the original on April 11, 2014. Retrieved June 10, 2014. ^ a b c d "Overview". State Climate Office of North Carolina. Archived from the original on July 31, 2016. Retrieved August 7, 2016. ^ "Severe Weather – Summer Storms". North Carolina Department of Transportation. Archived from the original on August 15, 2016. Retrieved August 7, 2016. ^ "Atlantic hurricane best track (HURDAT version 2)". Hurricane Research Division (Database). National Hurricane Center. May 1, 2018. Retrieved March 11, 2019. ^ "NOAA National Climatic Data Center". Retrieved October 24, 2006. ^ "April 16, 2011 North Carolina Tornado Outbreak". National Weather Service. February 3, 2012. Retrieved August 7, 2016. ^ "North Carolina's largest tornado outbreak – April 16, 2011". US Tornadoes. April 16, 2013. Retrieved August 7, 2016. ^ a b "NowData – NOAA Online Weather Data". National Oceanic and Atmospheric Administration. Retrieved December 16, 2011. ^ "NOWData – NOAA Online Weather Data". National Oceanic and Atmospheric Administration. Retrieved December 4, 2012. ^ "NOWData – NOAA Online Weather Data". National Oceanic and Atmospheric Administration. Retrieved April 14, 2012. ^ a b c "NowData – NOAA Online Weather Data". National Oceanic and Atmospheric Administration. Retrieved February 8, 2012. ^ "NowData – NOAA Online Weather Data". National Oceanic and Atmospheric Administration. Retrieved February 26, 2012. ^ "Climatological Information for North Carolina", USA.com, 2003. Web: . ^ a b "QuickFacts North Carolina; UNITED STATES". 2018 Population Estimates. United States Census Bureau, Population Division. January 16, 2019. Retrieved January 16, 2019. ^ Data Access and Dissemination Systems (DADS). "American FactFinder – Results". census.gov. Archived from the original on August 15, 2014. Retrieved May 29, 2012. ^ "2010 Census" (PDF). US Census. Retrieved August 21, 2011. ^ Population Division, Laura K. Yax. "Historical Census Statistics on Population Totals By Race, 1790 to 1990, and By Hispanic Origin, 1970 to 1990, For The United States, Regions, Divisions, and States". Archived from the original on July 25, 2008. Retrieved January 5, 2015. ^ Center for New Media and Promotions(C2PO). "2010 Census Data". Retrieved January 5, 2015. ^ a b "North Carolina". Modern Language Association. Retrieved August 16, 2013. ^ "Cherokee". Ethnologue. Retrieved April 11, 2014. ^ "North Carolina: Religious Traditions". State Membership Report. Association of Religious Data Archives. 2010. Archived from the original on December 17, 2013. Retrieved June 10, 2014. ^ Whitsell, Robin (February 26, 2008). 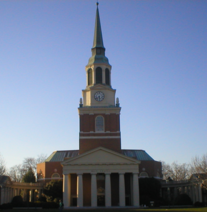 "Religiously-Affiliated North Carolina Colleges". Carolina Parent. Archived from the original on October 29, 2013. Retrieved June 10, 2014. ^ "Annual Estimates of the Resident Population for Counties: April 1, 2010 to July 1, 2015 – U.S Census Bureau". Census.gov. Archived from the original on June 6, 2016. Retrieved May 19, 2016. ^ "Annual Estimates of the Resident Population for Incorporated Places: April 1, 2010 to July 1, 2015 – U.S Census Bureau". Census.gov. Archived from the original on October 19, 2016. Retrieved May 19, 2016. 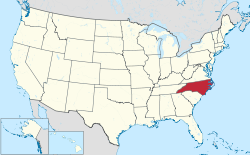 ^ "North Carolina (USA): State, Major Cities, Towns & Places". U.S. Census Bureau. July 1, 2017. Retrieved January 16, 2019. ^ a b c d "Population Estimates 2017 Combined Statistical Areas: April 1, 2010 to July 1, 2017". U.S. Census Bureau. January 16, 2019. Retrieved January 16, 2019. ^ "U.S. Population in Poverty Percentage State Rank Based on ACS 2010-2014 data". Usa.com. Retrieved July 14, 2017. ^ "Crop Profile for Tobacco in North Carolina" (PDF). Regional IPM Centers. December 2015. Retrieved January 17, 2019. ^ "Local & North Carolina state news from Raleigh, NC – NewsObserver.com". Archived from the original on March 8, 2014. Retrieved January 5, 2015. ^ "statedatalab.org: "The 19th worst state", Truth in Accounting" (PDF). ^ a b "About NC". State of North Carolina. Retrieved August 7, 2016. ^ "North Carolina Agriculture". State Library of North Carolina. Archived from the original on August 11, 2016. Retrieved August 7, 2016. ^ "States by Total Trees Harvested" (PDF). National Christmas Tree Association. Retrieved August 7, 2016. ^ "About the Census". United States Department of Agriculture. Retrieved August 7, 2016. ^ "NC Department of Transportation Article: North Carolina's Future Rides on Us". NC Department of Transportation. Retrieved September 22, 2012. ^ a b Leip, David. "General Election Results – North Carolina". United States Election Atlas. Retrieved November 18, 2016. ^ "North Carolina Public Schools". Ncpublicschools.org. Retrieved January 31, 2012. ^ a b "NC Public School Facts". Ncpublicschools.org. Retrieved July 24, 2011. ^ The University of North Carolina. "Our 17 Institutions". Archived from the original on January 7, 2012. Retrieved January 5, 2012. ^ NCSU. "About NC State:Discovery begins at NC State". Retrieved January 5, 2012. ^ "Stats Report Viewer". nps.gov. ^ "All About Asheville". 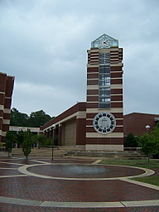 ashevilleguidebook.com. ^ Kate Rinsema. "The United States' happiest places [infographic] – Holy Kaw!". Holy Kaw!. Archived from the original on January 18, 2015. ^ "What To Do Across North Carolina". VisitNC.com. 2006. Archived from the original on December 1, 2006. Retrieved December 18, 2006. ^ "North Carolina Arts Council". Ncarts.org. Retrieved July 14, 2017. ^ "North Carolina Museum of Art Museum Backgrounder" (PDF). Ncartmuseum.org. Archived from the original (PDF) on October 19, 2012. Retrieved July 14, 2017. ^ "N.C. Museum of Art: Rembrandt Exhibit Pumped $13 Million Into Wake County Economy". SGR Today. ^ "Hey, James Taylor – You've got a ... bridge?". Rome News-Tribune. May 21, 2002. Retrieved June 28, 2009. ^ Waggoner, Martha (October 17, 2008). "James Taylor to play 5 free NC concerts for Obama". USA Today. Associated Press. Retrieved June 28, 2009. ^ Garner, Bob (2007). Bob Garner's Guide to North Carolina Barbecue. John F. Blair, Publisher. ISBN 978-0-89587-254-8. ^ Craig, H. Kent (2006). "What is North Carolina-Style BBQ?". 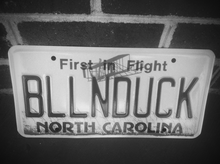 ncbbq.com. Retrieved February 15, 2010. ^ "USS North Carolina 'brought to life' again". WRAL-TV. May 3, 2008. Retrieved February 4, 2010. ^ "General Assembly of North Carolina". Retrieved November 8, 2016. ^ "Secretary of State of North Carolina". Retrieved July 24, 2011. ^ "NASCAR made North Carolina's official state sport". SportingNews.com. 2011-06-21. Retrieved January 26, 2012. The North Carolina Senate is the upper house of the bicameral North Carolina General Assembly. The Senates prerogatives and powers are similar to those of the other house and its members do, represent districts that are larger than those of their colleagues in the House. The President of the Senate is the Lieutenant Governor of North Carolina, Governor has very limited powers and only votes to break a tie. 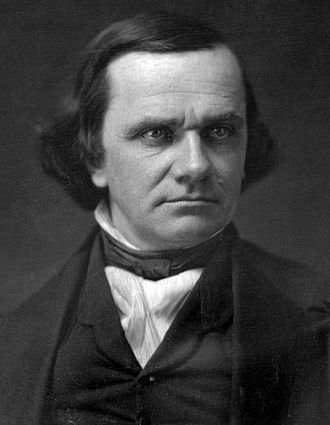 Governor was created in 1868, the Senate was presided over by a Speaker, after the 1988 election of James Carson Gardner, the first Republican Lt. 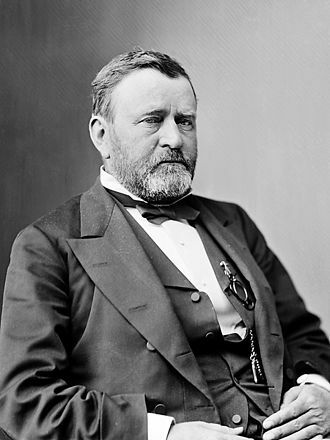 Governor since Reconstruction, Democrats in control of the Senate shifted most of the held by the Lt. 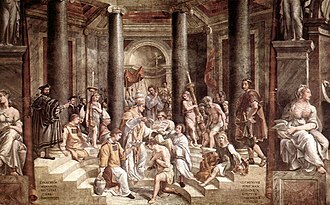 Governor to the senator who is elected President Pro Tempore, the President Pro Tempore appoints members to standing committees of the Senate, and holds great sway over bills. According to the constitution, the Senate is the Court for the Trial of Impeachments. 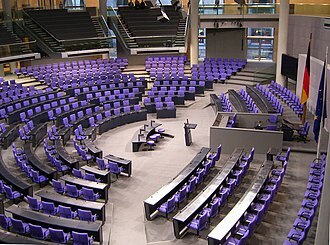 The House of Representatives has the power to state officials, after which the Senate holds a trial. 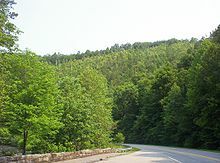 Mount Mitchell is the highest peak of the Appalachian Mountains and the highest peak in mainland eastern North America. 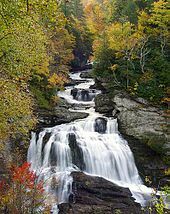 It is located near Burnsville in Yancey County, North Carolina, in the Black Mountain subrange of the Appalachians and it is protected by Mount Mitchell State Park and surrounded by the Pisgah National Forest. Mount Mitchells elevation is 6,684 feet above sea level, the peak is the highest mountain in the United States east of the Mississippi River, and the highest in all of eastern North America south of the Arctic Cordillera. The nearest higher peaks are in the Black Hills of South Dakota, Mitchell fell to his death at nearby Mitchell Falls in 1857, having returned to verify his earlier measurements. A4. 6-mile road connects the scenic Blue Ridge Parkway to a lot where a steep paved 980-foot trail leads through a conifer forest to the summit. The 40-foot stone observation tower on the summit was torn down in late 2006, a new observation deck was constructed and opened to visitors in January 2009. Also on the summit is the tomb of Dr. Mitchell, Mount Mitchell was formed during the Precambrian when marine deposits were metamorphosed into gneiss and schist. These metasedimentary rocks were uplifted during the Alleghenian orogeny. The mountains summit is coated in a stand of Southern Appalachian spruce-fir forest. Most of the mature Fraser firs, were killed off by the non-native Balsam woolly adelgid in the half of the 20th century. The high elevations expose plant life to levels of pollution, including acid precipitation in the form of rain, snow. These acids damage the red spruce trees in part by releasing natural metals from the soil like aluminum, to what extent this pollution harms the high-altitude ecosystem is debatable. While the mountain is still lush and green in the summer. Repairing the damage is an issue, as the pollutants are often carried in from long distances. Sources can be local or hundreds of miles or kilometers away, wildflowers are abundant all summer long. Young fir and spruce trees do well in the subalpine climate, the second highest point in eastern North America, Mount Craig at 6,647 feet, is roughly a mile to the north of Mount Mitchell. 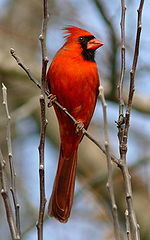 S.
Cardinals, in the family Cardinalidae, are passerine birds found in North and South America. They are known as cardinal-grosbeaks and cardinal-buntings, the South American cardinals in the genus Paroaria are placed in another family, the Thraupidae. They are robust, seed-eating birds with strong bills, the family ranges in size from the 12-cm,11. 5-g orange-breasted bunting and up to the 25-cm, 85-g black-headed saltator. They are typically associated with open woodland, the sexes usually have distinctive appearances. The northern cardinal type species was named by colonists for the red crest. The North American buntings are known as such to distinguish them from buntings of the Old World family Emberizidae, the name cardinal-grosbeak can apply to the Cardinalid family as a whole. Most species are rated by the IUCN as being of least concern, a study conducted in 2016 in Atlanta, Georgia on West Nile virus transmission in the United States, found that unlike other species, cardinals biologically suppress the disease upon infection. Roy Asberry Cooper III is an American politician and attorney who is the 75th and current Governor of North Carolina, since January 2017. 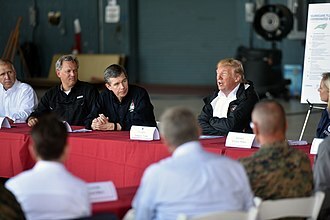 Prior to his governorship, Cooper had served as the Attorney General of North Carolina from 2001 to 2017 and was previously a member of the North Carolina State Senate. Cooper is a member of the North Carolina Democratic Party, on December 5, McCrory conceded the election, making Cooper the first challenger to defeat a sitting governor in North Carolina since 1850. Cooper took office as the 75th governor of North Carolina on January 1,2017, a ceremonial inauguration was scheduled for January 7,2017 but was postponed due to winter weather. 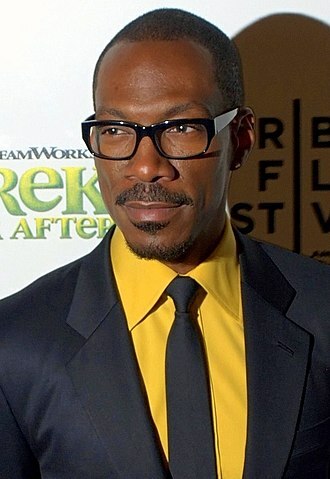 Cooper was born in Nash County, North Carolina, the son of Beverly Thorne Batchelor, a school teacher and he was raised in a rural community and worked in tobacco fields during the summer as a teenager. After practicing law with his familys law firm for a number of years, Cooper was elected to the North Carolina House of Representatives in 1986, in 1997, he was elected Democratic Majority Leader of the state Senate. He continued to practice law as the partner of the law firm Fields & Cooper in Rocky Mount and Nashville. Cooper was elected North Carolina Attorney General in November 2000 and took office on January 6,2001, Cooper was mentioned as a possible Democratic candidate for North Carolina governor in 2008, but he decided to run for re-election as Attorney General instead. He was easily re-elected, garnering more votes than any other candidate in the November 2008 elections. Both state and national Democrats attempted to recruit him to run against Republican Senator Richard Burr in 2010 and he was speculated as a possible candidate for Governor of North Carolina in 2012 after incumbent Governor Bev Perdue announced her retirement, but Cooper declined to run. His political consultant announced in 2011 that Cooper would seek a fourth term in 2012 and he was unopposed in both the Democratic primary and the general election. In the November 2012 elections, Cooper received 2,828,941 votes, in January 2007, when Durham District Attorney Mike Nifong asked to be recused from dealing with the Duke lacrosse case, Attorney General Coopers office assumed responsibility for the case. On April 11,2007, Cooper dismissed the case against the Duke lacrosse team players, declaring them innocent, the audit found that it was common practice for a select group of officials within the State Bureau of Investigation to withhold information. The two investigators, Chris Swecker and Micheal Fox, cited almost two hundred and fifty separate cases that were mishandled, Cooper argued his first case before the United States Supreme Court, J. D. B. v. North Carolina, in 2011. The Court ruled 5–4 against North Carolina, Cooper ran for Governor of North Carolina in the 2016 election against incumbent Republican Pat McCrory. After an extended battle, McCrory conceded the election to Cooper on December 5. Coopers transition into the governorship was marked by tensions with the Republican-controlled North Carolina General Assembly, in what The New York Times described as a surprise special session, Republican legislators moved to strip away Coopers powers before he would assume the governorship on January 1,2017. The North Carolina General Assembly is the state legislature of the U. S. state of North Carolina. The General Assembly drafts and legislates the state laws of North Carolina, the General Assembly is a bicameral legislature, consisting of the North Carolina House of Representatives and the North Carolina Senate. 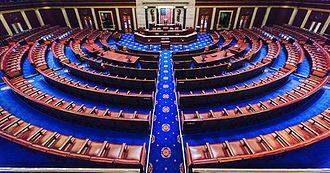 The House has 120 members, while the Senate has 50, there are no term limits for either chamber. Legislators in both chambers serve two-year terms, starting with the 2002 election, each legislator represents a single-member House or Senatorial district, prior to 2002, some districts elected multiple legislators. The General Assembly meets in the capital of Raleigh. It met in the Capitol building until 1963, when the relocated to the new North Carolina State Legislative Building. Though its members represent districts that are larger than those of their colleagues in the House, its prerogatives, the President of the Senate is the Lieutenant Governor of North Carolina, but the Lt. 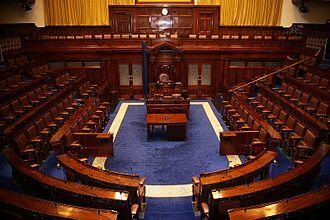 Governor has very limited powers and only votes to break a tie, Governor was created in 1868, the Senate was presided over by a Speaker. After the 1988 election of James Carson Gardner, the first Republican Lt, Governor since Reconstruction, Democrats in control of the Senate shifted most of the power held by the Lt. Governor to the senator who is elected President Pro Tempore, the President pro tempore appoints members to standing committees of the Senate, and holds great sway over bills. According to the constitution, the Senate is the Court for the Trial of Impeachments. The House of Representatives has the power to state officials, after which the Senate holds a trial. Governor is the official who has been impeached, the Chief Justice of the North Carolina Supreme Court presides, the 120 members of the House are led by a Speaker, who holds powers similar to those of the Senate President pro-tem. The North Carolina legislature traces its roots to the first assembly for the County of Albemarle, Albemarle County was the portion of the British colony of Carolina that would eventually become North Carolina. From approximately 1666 to 1697, the Governor, his council, by 1697, this evolved into a bicameral body, with the Governor and his council as the upper house, and the House of Burgesses as the elected lower house. An American male cardinal feeds on a sunflower seed.